Last week, I was called about triaging a patient to the intensive care unit. 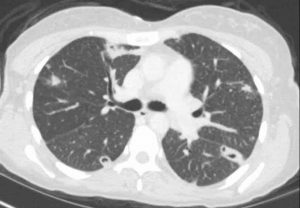 A 38-year-old woman had come to a rural Ohio hospital emergency department with sepsis and chest x-ray changes that looked like septic emboli. She uses intravenous heroin. The opioid epidemic in the U.S. has primarily received a lot of press because of the exponential rise in overdose-related deaths and the recent use of intranasal naloxone to revive patients with opioid overdose. But America’s heroin and fentanyl epidemic has had another result that no one talks about… the recent epidemic of endocarditis. 15 years ago, the primary risks for infective endocarditis were mitral valve prolapse and rheumatic heart valvular disease. We taught our medical students to look for Roth spots in the retina and splinter hemorrhages under the fingernails. Why? Because most endocarditis was the result of infection of the mitral and aortic valves on the left side of the heart, resulting in showering of the body with little bits of infected material that flowed through the arterial blood and embolized the retina or small blood vessels under the nails. But things have changed and now we see much more tricuspid valve endocarditis from IV drug use. 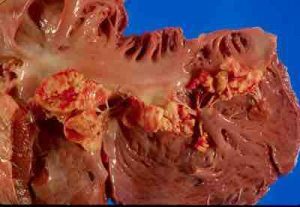 Rather than embolizing the peripheral arterial system, the infected bits break off of the tricuspid valve and embolize the lung. 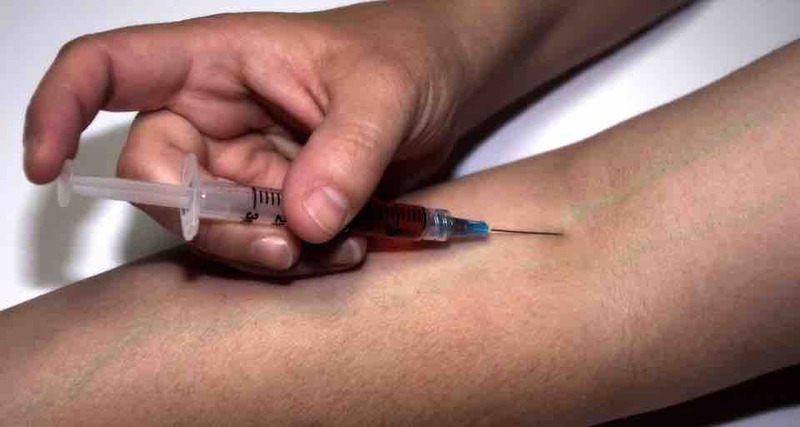 This summer, the Center for Disease Control reported on how the increase in IV drug use has resulted an increase in endocarditis in North Carolina. From 2010 to 2015, endocarditis resulting from IV drug use increased 12-fold. The total cost of hospitalization increased 18-fold, from $1.1 million/year in 2010 to $22.2 million per year in 2015. The median hospital charge per patient was $54,281. Most of these patients were young (under age 40), non-Hispanic white, and from rural areas. They were also usually low-income, with 19% uninsured and 22% on Medicaid. That means that for 42% of these patients, the costs are ultimately covered by society and not by private insurance or by the individual patient. From personal experience, I can tell you that the same thing is happening in Ohio. And if the experience in North Carolina is representative of what is happening in the rest of the country, then by extrapolating by the population of North Carolina compared to the U.S., then our country spent $707 million treating 8,724 patients with endocarditis from IV drug use in 2015. And at that pace, we will be well over $1 billion this year. Even more, because 36% of patients with endocarditis from IV drug use also have hepatitis C, to treat the hepatitis C in these patients alone adds another $300 million per year. Treatment of IV drug users with endocarditis is complicated. If you treat them medically, with antibiotics, then you are often faced with a prolonged course of intravenous antibiotics. The means placing a PICC line and either keeping them in the hospital for prolonged periods of time (at a huge cost) or discharging them with a ready-access for them to inject themselves with more drugs. 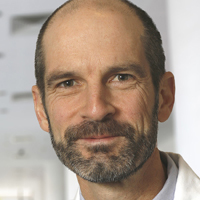 Although oral antibiotics have been used in selective patients with tricuspid valve endocarditis, even this can be challenging since IV drug users are often not very good about taking their medications reliably or showing up for their clinic appointments. Surgery is even more problematic. Patients with endocarditis from IV drug use have a very high rate of IV drug use recidivism and if you treat the endocarditis with an artificial heart valve, there is a much higher risk of another bout of endocarditis involving the artificial valve. Also, if an artificial valve is placed that requires chronic anticoagulation, there is the risk of the valve thrombosing if the patient is not compliant with anticoagulants. These patients do not fare well long-term: studies show that about one-half of patients with endocarditis from IV drug use treated with surgery are dead within 2 years. Many surgeons will not operate on IV drug users with endocarditis unless they are in a drug rehab program. From the hospital’s standpoint, these patients are like hot potatoes, no one wants to be stuck with them because they will likely be in the hospital for at least 6 weeks getting IV antibiotics and the hospital will take a financial loss on each patient. Because management of the patients almost always requires cardiothoracic surgery consultation (even though we know up front that the surgeons will likely decline doing surgery), the patients get transferred up the hospital chain to large hospitals that have heart surgeons with experience operating on infected heart valves. Therefore, the cost of these patients is borne mainly by tertiary care hospitals, most commonly our nation’s academic medical centers. The total costs of IV drug use-associated endocarditis are enormous. If the patients are treated only to die from continued drug use (as is the case with half of those getting heart surgery), they they never get a chance to become employed and to be tax-paying contributors to society. If they are treated but become disabled, then they incur decades of Social Security disability costs and Medicare costs. These are all over and above the $54,000 cost incurred by the initial hospitalization. The ultimate solution is to get Americans to quit using intravenous drugs. But that is not going to happen anytime soon.